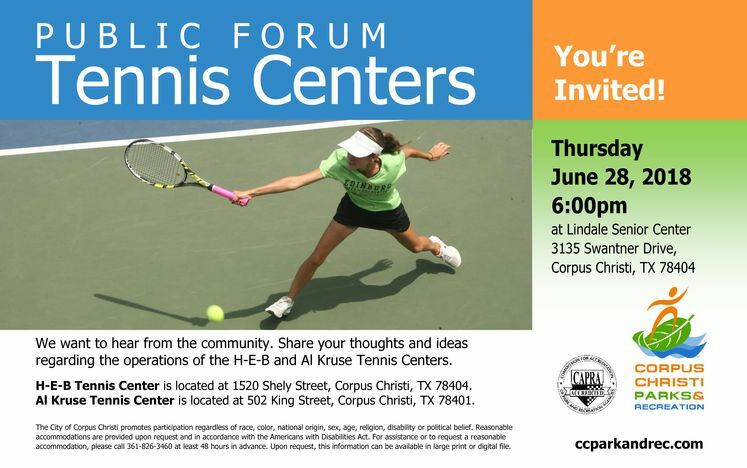 CORPUS CHRISTI, TX – The Corpus Christi Parks & Recreation Department invites the community to a public forum for city tennis centers on Thursday, June 28, at 6:00 p.m. at the Lindale Senior Center located at 3135 Swantner Drive. Department representatives want to hear from interested community stakeholders about their thoughts and ideas regarding the operations of the H-E-B Tennis Center and Al Kruse Tennis Center. H-E-B Tennis Center is located at 1520 Shely Street (map), and Al Kruse Tennis Center is located at 501 King Street (map). For more information, please contact E. Jay Ellington, Director of the Corpus Christi Parks & Recreation Department, at (361) 826-3464 or JayEll@cctexas.com .